Skegness Pier as it stands today, the pier is almost unrecognisable from its original guise that was built in Victorian times. It is however a true testmony to how a pier has evolved and survived its dramas to be a treasured part of the towns heritage. The railway arrived in Skegness in 1872 and shortly afterwards came the tourists and day trippers, all keen to fill their lungs with that bracing and invigorating sea air. The pier was constructed during 1880 and opened in 1881. Such was its prominence that it was actually opened by the Duke of Edinburgh (of the time). Like so many other buildings the pier was constructed with a great deal of pride and not just civic pride, but a pride in the era in which it was built. The Victorians simply did not do shy, retiring and discreet buildings, instead they channelled their creative energies into big, lavish statements and Skegness pier was certainly one of these. With a length of over 1817 feet, a width of 25 feet and an elaborate gothic archway leading to its entrance, which was, at the time at the top of a flight of 8 steps, the pier was simply awesome. This really was Victorian grandeur at its very best. Even the fact that it was accessed by 8 steps was a classic indication of its elevated status. The pier was also not without its facilities and these were particularly modern for the time. An impressive pier head, constructed in a neat T shape, provided a concert hall, which had been designed to accommodate 700 people. Soon it was to become a firm favourite with the crowds. By 1889 it was already attracting numbers, which sometimes topped 20,000 people a day. When you consider no one had a car, this was a serious amount of visitors. But people flocked to Skegness and it has always remained a favourite with many day trippers or people having short breaks. It is not as brash as Blackpool or Brighton, nor has it the slightly elderly and genteel feel of Llandudno; it is more a mixture of families, from grandparents to tiny toddlers. As visitors started to take Skegness into their hearts, the facilities on offer also increased to cater for their tastes. Various musical acts trod the boards, as well as military bands and occasional crowd pullers such as confetti battles. Skegness pier has never tried to be something that it is not and has no pretentious airs or graces about it, but it is a place to come and have fun and simply enjoy the day or a couple of days. And so it was in Victorian times and through the early part of the 20th Century. Despite the advent of the First World War, the pier continued to thrive, particularly after 1918, when the war had ended. But this was to be short lived, for in 1919, a schooner crashed through the pier, causing a breach in the pier, which was replaced by a temporary gangway to cross the damaged area. This temporary facility lasted until 1939, when the damage had been fully restored to its former glory at the same time the original gothic archway was replaced with a concrete art deco style entrance archway incorporating shops and covering the entrance in a glass canopy. The understructure of this landbased section was completly covered over. But the Second World War meant that parts of the pier had to be closed off to prevent invasion. Finally, it opened again in 1948, with a wider range of tourist attractions, such as a cinema, shops and of course amusement arcade type games. The glass canopy starting at the 1930’s entrance was taken further back covering the open deck right up to the boating waterway at the beach side promenade. The pier sustained some flood damage in 1953, but was only significantly refurbished in 1971. The original 8 steps,30’s entrance and part of the glass canopy was completly demolished and bought to ground level, replaced by a huge steel and glass entertainment center housing arcades, shops and a luxury variety bar. The concert hall, by this time a theatre, was also enlarged taking over most of the pierhead open decking and it now had over 1,000 seats. These refurbishments were to put the original pier company into financial strain and the pier was sold to Robin Mitchell head of a local engineering company in the mid 70’s. However, disaster was soon to strike in the form of serious damage, which was caused by devastating high storm tides on the night of 11th January 1978. The theatre was effectively cast adrift from the rest of the pier along with the central shelters as large lengths of decking, girders and legs were completly sheared away at either side between the theatre and centrals shelters. Whilst the central shelters were removed eventually, the theatre was left to languish marooned out at sea as various experts tried to sort out what to do with it. Hopes remained that one day it could be reinstated with the remaining length of undamaged open decking at the shoreward end but this was never to come to fruition. Eventually, in 1985, work began to demolish the marooned theatre, since it was feared that due to its dereliction it might have presented a hazard for boats in the area. However, further problems were to be faced when the theatre caught fire as it was being demolished. Whilst much of the theatres insides had been removed after the storm between tides the fire destroyed parts hoped for exhibition. The owners have always strived to maintain and upgrade the remaining pier both inside the landbased entrance pavilion and the remaining 115 meters of decking stretching down the beach to the sea. Already by the June of 1978 an astroliner ride was installed on the decking which remained well into the 80’s. The Astroliner was soon followed by the Starwheel, dodgems, shooting galley and refreshment kiosk as of any self respecting seaside pier as the pier deck was widened at its very shoreward section with extentions built around it. With these extentions built around the pier the original railings moulded into seats with shields incorporated into the back were removed and plain industrial style railings painted blue were installed. The pier was now a funfair beach deck providing hours of seaside fun throughout the 80’s. Further bad luck was again to strike the pier in the October of 1987 when high storm tides damaged the modern extentions surrounding the original pierdeck. The legs of the platform were not of high density as the central section fixed deep into the beach with their iron screw piles, instead these were set in blocks of buried concrete. The understructure of the extentions required securing ready for the spring season of 1988. Into the 90’s the extentions had been removed almost completely revieling the full underframework of the victorian pier. Only two extending pieces at both sides on exit from the pierdeck amusements remain of this as the rest of the pier below deck is the full remains of the 1881 pier. The pier was now a double head T shape the oposite way around as the seaward end as always since terminated where it was cut off during 1978. Kiddie rides, an hot dog and ice-cream kiosk, trampoline and inflatable giant slide were the open deck attractions with wood slat benches painted brightly at intervals along the neck, poles incorporated into the now red painted railings strung with fairground style lightbulbs. In 1992 The variety bar in the entertainment center gave way to a tenpin bowling center beside the licensed bar which remains to this day. In January 2000 the owners started a complete refurbishment programme of the pierdeck returning to the pier a classic ornate charm. The entire pier as been redecked and gone are industrial style painted railings, replaced with florals and swirls in continuous panels, victorian style streetlamps along its length. The adding of two new girders slanting towards the pierneck has much widened the shoreward pierhead of today. In 2004 the trampoline was joined with a daring modern bungee jump attraction which sits happily alongside the famous Cheryls cafe kiosk which has also been given a traditional makoever. A further ice cream kiosk is adjacent and an hook a duck stall and the kiddie rides and giant slide of the 90’s remains. Smart wooden slat benches with curved iron legs and arm rest terminating in lions heads at dotted intervals echo the piers original seats and shields from the pier in 1881 have been added into a iron archways above steps leading up to the deck from the beach. Elegant ornate archways on poles suspend a short glass open canopy at the french doors that lead onto the pierdeck. These are reminiscent of ornemantal archways that once surrounded the sea end saloon of 1881. 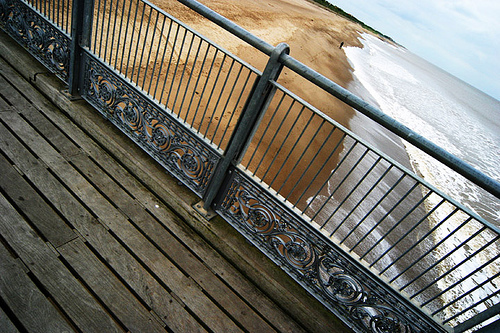 Skegness Pier of today consist of 4 parts of it long history and redevelopments. The front entrance Pavilion dating back to 1970, its central section the pierdeck amusements dating back to 1948 and of course beyond this is the open deck stretching down the beach to the sea being the original victorian pier below deck. There are signs of its victorian past still present if you look for them. Under the pier deck the original legs are topped with florid capitals where they meet the girders and as previously mentioned the little iron shields used in the beach step signs. A mural of the 1881 pier is painted up high in the entrance amusements. The on deck architecture like refurbished piers is now repro victoriana but as made the pier again the pride of the town. 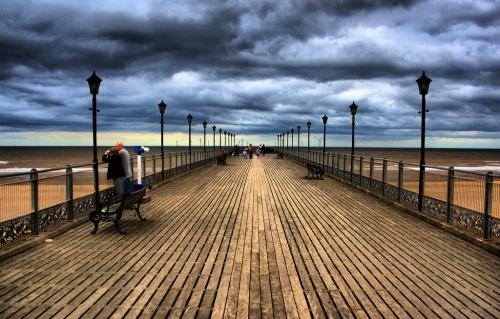 Skeggy as its affectionately known continues to love its pier. There is quite lot to do here, although if you are an ornemental architecture buff, the front parts of the pier will not be of great interest however the design of these parts do represent its history and its continued success. The front being unmistakeable and unique 70’s seaside architecture with its concave sloped roof and the pierdeck amusements beyond 40’s and 50’s utilarian. This amazing building is one of the biggest leisure attractions on the east coast, it has a full range of facilities. The sight of it lit up at night is to be behold. The design of the refurbished pierdeck will be of greater interest to purist and it was awarded an engineering award for the excellance of the on deck work thats been done. Skegness does not have the number of fairground rides that other piers offer, but it has a state of the art laserquest as well as 10 pin bowling, ‘glowbowling’, which is straight from the US and a really great camel racing experience, for the young at heart or those who like to have a good time. There is even a kids activity centre, where the kids can play, even if it is wet, which is a real bonus in late or early season. So whatever the weather or whatever you are interested in, Skegness has something to offer everyone. The emphasis for Skegness is very much on family fun, which makes it a very vibrant place, but also one that is suitable for all ages. The buildings before the pierdeck have been greatly upgraded and improved over the years and various ramps and different entrances surrounding it ensure that access to the pier is available to everyone. This is a positive measure for thos with mobility difficulties or use of pushchairs. There is no entrance fee to the pier itself, but fees are applicable if you want to try your hand at bowling or the children want to go to the Adventureland. It isn’t the longest pier in the world, at only 115 metres, but you can get a good view from the end of the pier and it is particularly refreshing on a hot sunny day, to get the slightly cooler air at the end of the pier. But conversely, if the weather is wet and windy, then there is plenty to do inside. Due to the fact that the beach end of the structure is a shorter pier, the range of marine life to be seen isn’t great, but there are quite a few birds around, particularly at the end of the pier. So it may be worth taking a stroll down and just checking out what is around. It is also a refreshing feeling when the tide does roll in well under the seaward end and you feel that unmistakeable pier thrill of the waves crashing below. A victorian transported into our times today certainly wouldnt look out of place strolling on the open deck seaward end and though its once greater length is shortened and the above deck refurbished and repro this is without any doubt the 1881 pier carried by her historical legs and girders down to the sea. A gentler and serene treasured part of the towns heritage. As the slogan that was used many years ago for Skegness Pier during the 50’s and 60’s, it certainly still is ‘The Pier, The Place’. 9am until 10.30pm (ish) in the summer and Noon until around 8pm in the winter. Hours do vary within these parameters during Spring and Autumn, as they vary the hours according to the number of visitors. Unfortunately the picture isn’t mine to give you permission to use it. If you click on the picture it will take you through to someones flickr account and you will need to contact the photographer as I did to ask for permission. 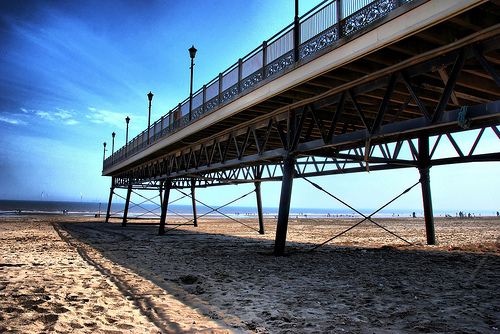 Hi im Katie Bardovskis a pupil from Skegness Grammar School and I was wondering if i could use your picture of the Skegness pier for my Gcse project. Thankyou please could you get in contact with me as soon as possible.